Many of the preparations that you do prior to a camera sweep of your office will depend on the type and size of your business. However, there are some key guidelines that it is a good idea to follow no matter what business sector you are in. Read on to find out more about these. The first and most important thing to do, as soon as you even think someone is watching or listening to you, is to act normally. Changing as little as possible, in terms of routines, work plans, and meetings, means that the individual spying on you is less likely to realise they have been found out. This is important if you want to increase your chances of tracing the devices back to their owner. However, that being said, it is also important to ensure that anyone who needs to know is made aware of the situation so that as little information as possible is given away. Keep the number of people that are aware down to the bare minimum and ensure that those you do need to inform are told away from the premises. Apply the same technique when you contact the counter surveillance company that you want to undertake the bug sweep. Again, this helps to ensure your privacy. When discussing your bug problem with the private investigator, make sure you give as full an account as possible of the problem. This will help them to determine your security risk and aid them in planning the best way forward with you. Following these guidelines will ensure that your camera sweep by Advanced Sweeping is highly effective, secure and confidential. Our fast response operatives can get to you day or night to fit around your company’s needs. 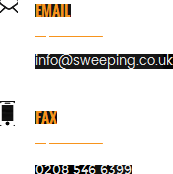 Contact us today through our email: info@sweeping.co.uk, call securely on 0845 512 1552, or visit http://sweeping.co.uk/.